Euston Road at corner of former Euston Grove, showing bus entrance to Euston Station, 2013. Today, Euston Grove, London NW1 is little more than a roundabout for buses outside Euston Rail Station. Its most noticable feature is Reginald Wynn Owen’s arresting memorial to railway men and women lost in war. One hundred and fifty years ago, Euston Grove was a bustling, fast-growing London street – home to the country’s first metropolitan rail station and home to one of Britain’s most important zoologist, Robert Edmond Grant. As a historian interested in the way places shape activities, I wanted to find out more about Euston Grove: why did this street take the shape it did? what did it feel like to walk along its pavement? where did it all go? This essay reports some of the things I found. I had no idea when I started just how fascinating this one street would prove to be. The district was defined as north of the New Road (now Euston Road) connecting Paddington and Islington, east of Tottenham Court Road, west of Somers Town, and surrounding the newly defined Euston Square. For a long history of this area, see Besant (1914). Luxury building seemed to focus around Euston Square. Commercial building seemed to focus further west, linked to Tottenham Court Road. 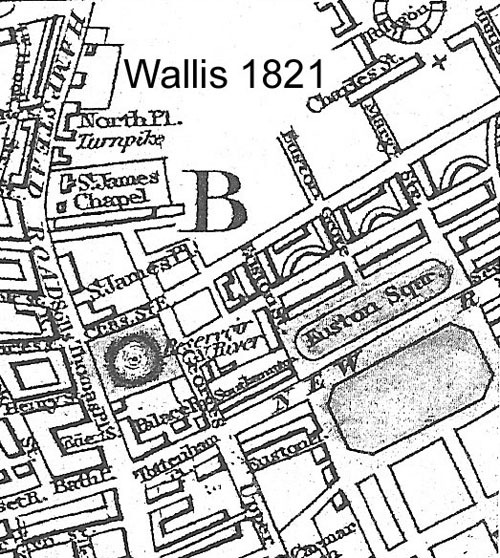 Changes around Euston Square were some of many development schemes in north London in the early 19thC. The metropolis was expanding rapidly. Bloomsbury was growing. Nash was redesigning Regent Street and north to Regent’s Park. In this frame, St Pancras parish was the next big opportunity. Wanting funds to invest in property elsewhere, the Duke of Bedford signaled his willingness to sell or lease land in St Pancras parish. This must have seemed alluring for developers, considering expanding infrastructure: the availability of the New Road (now Euston Road) connecting Paddington and Islington, the arrival of Regent’s Canal (Paddington to Camden, 1816; remaining, 1820), and the easy-to-use toll road in Tottenham Court Road. 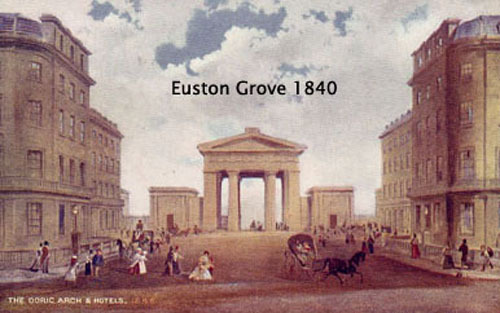 In the 1830s, Euston Grove became the focus for a major new rail service connecting London to the midlands. The newly formed London and Birmingham Railway (LBR) wanted to locate their London terminus somewhere in north London. Chalk Farm was their original choice, confirmed with land purchases in 1833. Several groups wanted to locate the terminus closer to population centres. This included Robert Stephenson (working as LBR’s chief engineer on the project), who proposed Euston in August 1834. This view won the argument, receiving Parliamentary approval in 1835. 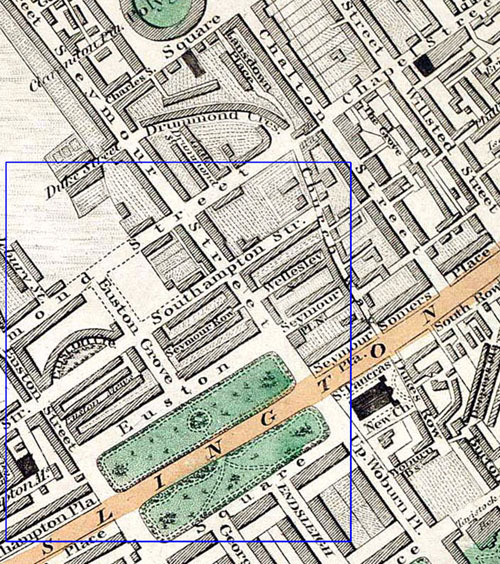 LBR purchased pastureland north of the intersection of Euston Grove and Drummond Street for their London terminus. LBR’s 1835 map, printed to recruit investment and political support, called their new London terminus “Euston Grove”. This served passengers and packets. Chalk Farm remained a depot for large parcels, excess baggage, freight, and livestock. Interestingly, Euston Grove was a poor engineering choice. Steam locomotives of the 1830s lacked sufficient horsepower to move carriages laden with passengers and freight up the incline to Chalk Farm. And the space in Euston was too cramped for manoeuvring engines to turn them around. As a result, outbound trains from Euston Grove were powered by rope pulled from stationary steam engines located at Chalk Farm. On arrival at Chalk Farm, trains had their locomotive attached, and passengers continued on their way. Inbound trains were detached at Chalk Farm, then coasted into Euston Grove with the skill of brakemen. This arrangement lasted until July 1844, when more powerful locomotives were available. Passenger service at Euston Grove began in 1837, with daily service completed to Boxmoor. On 17 September 1838 passenger service began along the whole line to Birmingham, though coach service was still briefly required near Birmingham. Major stations en route included: Harrow, Watford, Boxmoor, Berkhampstead, Tring, Leighton Buzzard, Bletchley, Wolverton, Roade, Blisworth, Weedon, Crick, Rugby, Brandon, Coventry, Hampton, and Birmingham. Travel time to Birmingham took five hours. Passenger numbers leaving Euston Grove showed seasonal patterns: for 28 days ending 18 Oct 1838 (50,238); 15 November 1838 (39,601); 13 December 1838 (29,145); 10 January 1839 (35,608); 07 February (31,985); 07 March (33,081). Passengers weren’t the only source of revenue, of course. Excess baggage, parcels, and goods moved in high volume. The Euston terminus was large. The main terminal was a 200ft 2-storey brick building, with separate ground floor booking and waiting facilities for different class passengers. LBR offices occupied the upper floor. It was designed by Philip Hardwick. Adjoining to the east were the tracks, covered by a 200x50ft iron ‘shed,’ designed by structural engineer Charles Fox. The terminus was significantly expanded in the 1840s, following mergers in the railway business and a strategic decision of the new London and North Western Railway company (LNWR) to focus its operations at Euston Grove. The new terminal opened in 1849 and remained in service until the 1960s. LCC (1949) provides a definitive account of both terminals. Postcard, “The Doric Arch and Hotels” along Euston Grove at Euston Square, 1840, London. This extended east-west along Drummond Street, with the doric Propylaeum centred on Euston Grove. At 72ft in height (apex of the acrotherium) with columns 8.5ft wide and just over 44ft tall, this feature easily was visible from the New Road and Euston Square. Functionally, the gates and fencing had a security function, controlling access to LBR property. Lodges offered commercial services (a post office to the east; telegraph office to the west). But the screen offered much more. Designed by Philip Hardwick and costing LBR £35,000, the screen’s neo-classical style followed architectural fashions in Regency London. The Propylaeum was intended as the “grand entrance” for the station. It came to be known as the “Doric Arch” or “Euston Arch”. The particular design choice of a Greek entrance probably was inspired by contemporary reports of excavations and restoration work on similar structures in Athens. The screen is beautifully depicted in John Cooke Bourne’s lithograph published among his Drawings of the London and Birmingham Railway (1839), which was later sold as hand coloured prints and much copied (view Bourne’s lithograph). Bourne’s 1839 depiction of the screen in his series Drawings of the London and Birmingham Railway, also contributed in no small part to this campaign. The architectural screen was commissioned in July 1836. See Britton (1839), LCC (1949), and Smithson and Smithson (1968) for architectural detail. It was built by W. and L. Cubitt. The screen was not fully completed until 1840. The Arch’s dominating presence in Euston influenced facade design elsewhere in the street, including Friends House (1925-27), the Wellcome Building (1931-32), the National Amalgamated Approved Society’s Building (1932), and subtly Bently House (1938). Construction along Euston Grove itself was intimately tied to the railway terminus. During the initial building works, LBR also purchased open land on both southeast and southwest corners of Euston Grove’s intersection with Drummond Street. The company widened the street into a plaza, which was named Euston Place, and constructed two new hotels at the intersection. These opened in September 1839. The Victoria Hotel (SW) offered only basic sleeping accommodation and coffee house services, meant for working class men. The Euston (other times Adelaide, SE) Hotel offered a full service, catering to middle class families and first class travelers. 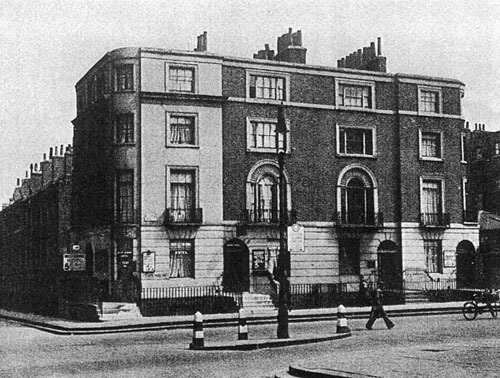 Houses lined Euston Grove to the south of the hotels for the one block separating them from Euston Square (i.e., south of Melton Place-Seymour Crescent. It’s not clear when these were built, but they were occupied from the 1840s. Euston Grove’s most notable resident was Robert Edmond Grant (1793-1874), University College’s first professor of zoology and comparative anatomy (Parker 2006). 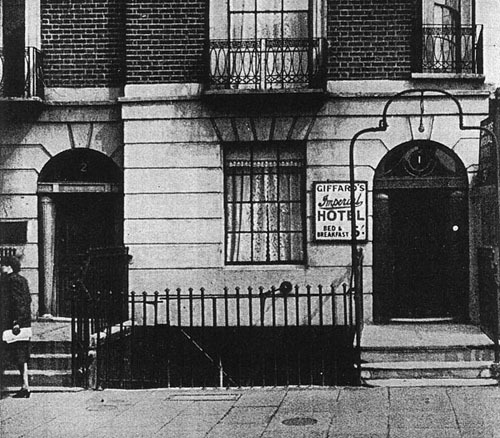 Grant lived at number 2 Euston Grove between 1858-1874. (Images below; Parker 2006 has a different set of photographs.) Preceding Grant at number 2 (between 1845-1853) was the Shakespearean actor John Cooper. Slowly these houses converted into hotels. At number 5 Euston Grove lived John Knaggs, surgeon (c1852-1875). Number 2 (left), Euston Grove within building (numbers 1-4) on east side of the road. Photograph, no date. As a street, Euston Grove remained essentially intact until the 1869, when it was extended south through Euston Square to connect with Euston Road. 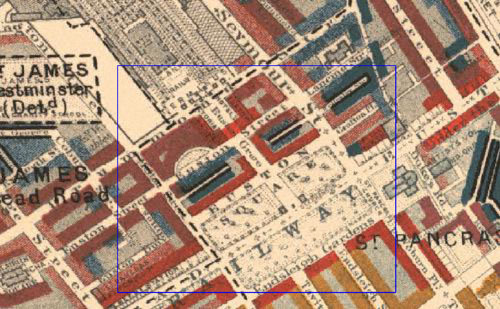 The street was widened to 80ft to accommodate increased traffic and two new lodges were built (completed 1870) at the intersection with Euston Road (map). Designed by J.B. Stansby (architect for LNWR), these lodges were new constructions; they were not simply moved from the original screen. These lodges were symbolic features in the square, though they also functioned for some time as information and parcel collecting points. A bronze statue of Robert Stephenson (commissioned by the Institution of Civil Engineers and created by Baron Carlo Marochetti) was placed in the central reservation at the Grove’s entrance. 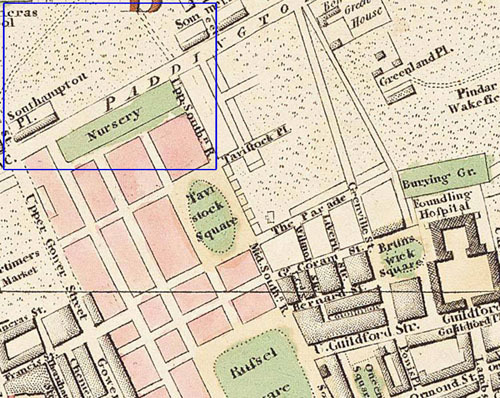 Map (1878) of Euston Grove following bisecting of Euston Square and construction of carriage buildings along Euston Road. In distance is Euston Arch, part of neo-classical screen for Euston terminus of railway. During these 1869-70 building works, the Propylaeum was refurbished. The word “Euston” was carved into the architrave view. By 1881 the hotels at the north end of the street had consolidated into the Euston Hotel. Additional rooms were created by constructing a wing over Euston Grove, thereby blocking the view from Euston Road to the Propylaeum. An underpass still allowed north-south traffic. 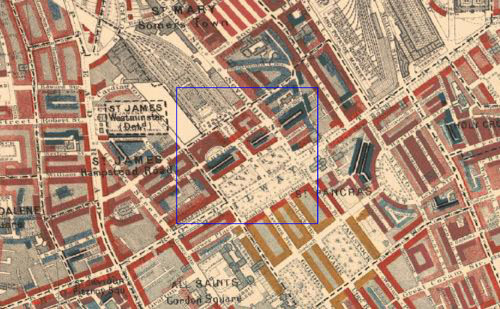 Booth’s (1898-99) famous Maps descriptive of London poverty identified Euston Square and Euston Grove as red (meaning “middle class. well-to-do”) and purple (“mixed. some comfortable others poor”). Nearby mews are ranked as dark blue (“very poor, casual. chronic want”). 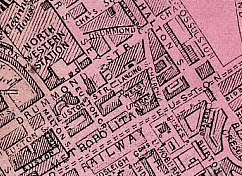 Booth Survey of London (1886), with Euston Square and Euston Grove highlighted. The other main feature of Euston Grove, Reginald Wynn Owen’s arresting memorial to railway men lost in the Great War, was added in 1921 in Euston Grove at the north edge of Euston Square. Additional plaques were added to service men and women following the 1939-1945 war. Euston Grove was damaged by bombing during World War II (Saunders 2005). Most of the former Victoria Hotel (south-west corner of Euston Place) was “damaged beyond repair,” and the remainder of Euston Hotel, the Propylaeum, and the original residence buildings on Euston Grove showed repairable blast damage. Melton Place was “seriously damaged but repairable”. Overall, Euston was not as severely damaged by bombing as other London districts. Most significantly, the district depopulated. In October 1941, the residential population in St Pancras was 56% of its 1939 numbers. Most of Euston Grove disappeared in the 1960s during expansion of Euston station as a main line rail service and major hub for London transport (BRLM 1968). British Rail extended the station south and west in line with Euston Square as well as north. In the process, the original LBR screen was removed, the Euston Hotel and Euston Grove residences were demolished, and Euston Grove was reduced to the 1869 cut through Euston Square. The new station opened in 1968, with 18 platforms along a 647ft frontage. An office block south of the station was completed in 1976 to a modernist style. It features a building screen blocking the view of the station from Euston Road. This is an architect’s echo of the 1881 expansion of Euston Hotel. The removal and disposal of Euston Arch caused considerable controversy. It sparked a preservationist campaign led by John Betjiman. Dan Cruikshank’s 1993 television programme for BBC2’s “One Foot in the Past” investigated this case. He located stones from the original screen had been used to line the River Lea in East London. The remainder of the screen is scattered. Some of the gates are on exhibition in the National Railway Museum in York. Besant, Walter. 1914. London: North of the Thames. London: Adam and Charles Black. Bourne, John Cooke. 1839. Drawings of the London and Birmingham Railway by J. C. Bourne, with an historical and descriptive account by John Britton. London: J. C. Bourne; Ackermann and Company; C. Tilt. Britton, John. 1839. Historical and Descriptive Accounts of the Origin, Progress, General Execution and Characteristics, of the London and Birmingham Railway: with References to the Accompanying Series of Drawings. In Drawings of the London and Birmingham Railway by J. C. Bourne, with an historical and descriptive account by John Britton, edited by J. C. Bourne. London: J. C. Bourne; Ackermann and Company; C. Tilt. BRLM. 1968. The New Euston Station 1968. London: British Rail, London Midlands Section. LBR. 1835. Map of the Line. London: London and Birmingham Railway. LCC. 1949. Survey of London. Volume 21. Tottenham Court Road and Neighbourhood. The Parish of St Pancras, part III. London: London County Council. Parker, Sarah E. 2006. Robert Edmond Grant (1793-1874) and His Museum of Zoology and Comparative Anatomy. London: Grant Museum of Zoology. Saunders, Ann, ed. 2005. The London County Council Bomb Damage Maps, 1939-1945. London: London Topographical Society and London Metropolitan Archives. Smithson, Alison, and Peter Smithson. 1968. 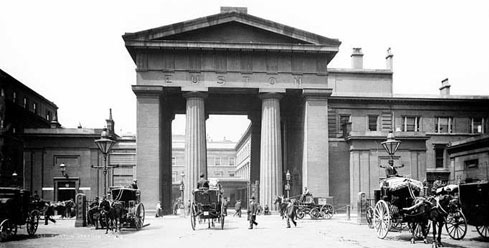 The Euston Arch and the growth of the London, Midland and Scottish Railway. London: Thames and Hudson.